There can’t have been many times throughout the existence of the human race when somebody has said 'We need to emulate what they’ve done in Burnley'. In fact, only three instances spring to mind. The first would be if you wanted to breed one of the finest swing bowlers to have played the game of cricket, then you’d want to emulate what they did in Burnley. A mere full toss from the away end at Turf Moor stands Burnley Cricket Club, where James Anderson learned his trade. 531 Test wickets and counting suggests they got something quite right there. Number two is when it comes to the delicacy known as the doner kebab pizza. Burnley at the turn of the decade was the first place I had the pleasure of experiencing what is basically a pizza topped off with an entire one of those big leg things of doner meat they have spinning around in kebab shops. Despite this seemingly being all the rage in that small corner of Lancashire, it has seemingly failed to catch on further south which remains one of my biggest regrets about the fact that I do not live in Burnley. The third and final 'We need to emulate what they’ve done in Burnley' is to do with their football team. For Burnley have over the past few seasons become the model for any mid to large sized Championship side who aspires to become an established Premier League club. And this is where the Albion need to take inspiration from the Clarets. We may have risen to the top flight in different ways, but the similarities are there for all to see. Both sides appointed talented yet unfashionable British managers in Sean Dyche and Chris Hughton. Neither of the club's promotion-winning squads were assembled particularly expensively and both were tight-knit groups, Burnley only using 25 players in their promotion season. The Clarets' first top-flight season under Dyche lasted just one campaign but they didn’t panic at the thought of relegation and stuck with a man they knew from personal experience could get them out of the Championship again. That loyalty paid dividends as they won the Championship title, stayed up the following season in the Premier League and now look on course to qualify for Europe. They could even yet finish above Arsenal. Food for thought for anybody out there doubting Hughton – even if we go down, the Burnley way shows loyalty and not panic is the way to make an instant return to the top flight. Burnley’s transfer policy has seen them sign players who have perhaps gone under the radar, turn them into better players and then sell them on at a profit. There’s been Andre Gray, Kieran Tripper, Danny Ings and Michael Keane, while Tom Heaton, Jack Cork, Ben Mee, James Tarkowski and Nick Pope have all made the England squad in recent months. 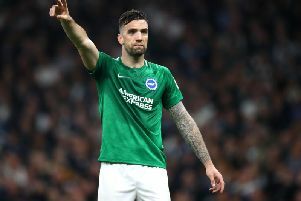 You can see similarities with what the Albion have done recruitment wise if you replace “young English bargains” with “foreign bargains” such as Maty Ryan, Pascal Gross and Jose Izquierdo. As a result, Tony Bloom could do a lot worse than picking the brains of his Burnley counterpart Mike Garlick in the boardroom at Turf Moor on Saturday about how to turn a Championship club into a Premier League one. But we suspect he already knows the Burnley model is the way to go.